Now, for the challenge! I am going to translate the Vans Warped experience for older music fans. Last week, one of my friends, Diana Butler Bass, asked her Facebook audience, “How, exactly, does one explain Neil Diamond and Barry Manilow to one’s 15 year old kid?” Many of her friends responded, but I do not think any of us had the right answer, perhaps because some questions are better unanswered. It is probably better that I never asked my parents to explain Starland Vocal Band‘s 1976 suggestive number one hit song “Afternoon Delight” when I was 8, which is about the same age as my children now. As long as there has been Rock & Roll, there has always been generational tension. Ellen Willis, my favorite rock critic, discussed the issue forty years ago when she feared that she might not understand the next generation of performers. Willis explained, “I had been nursing the private worry for some time… and realized once again that in rock, as in politics, there are no private worries.” (I worry that I am becoming a dinosaur who too often quotes dead rock critics.) She recounted how her mother had liked Elvis, but did not “get” Little Richard, and as a music fan, there is nothing worse than becoming one’s parents. Even Gene Simmons has grown up and become a family man. If you only know him from his reality TV show Gene Simmons Family Jewels, you may not believe that his band defined the live Rock & Roll performance (and the live album). When I was younger, KISS scared parents. Kiss scared other performers. He probably would have mocked the person he has become, although this says more about the rebellious nature of rock than it does about Gene Simmons. When I photographed the band New Year’s Day, I noticed former Kiss lead guitarist Ace Frehly‘s influence on guitarist Nikki Misery. Misery wore lightning bolts and makeup. (I did not notice the Ace button until I was processing photographs.) Misery was fun to photograph too. He moved fast and faced the camera. He also resembled Ace Frehly enough so that I could identify the influence, but not so much that I thought he had copied. 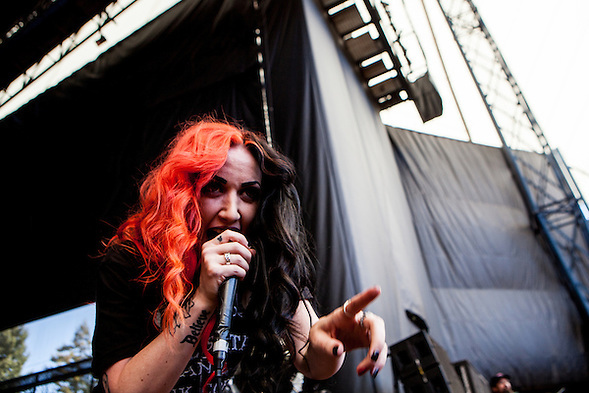 Ashley Costello is NYD’s exciting lead singer. She has bright red hair, a “Believe” tattoo and colorful T-shirt. I liked almost every photo of her and I could have taken more. When I reviewed the photos and continually saw the words “Yes” and “No” on her shirt, I linked the band to the 1989 movie When Harry Met Sally with its climactic New Year’s Eve scene. Ashley answered the question, “what would have happened the next day if Sally had said no on New Year’s Eve?” Sally would drink a cup of coffee and start a new year. Ten years after Harry met Sally, Julia Roberts was “just a girl, standing in front of a boy, asking him to love her” in Notting Hill. It is a really cute film, even if it is difficult to relate to Julia Robert’s movie star character who struggles to ask a boy to love her. Besides, we know the answer. (It’s a movie.) 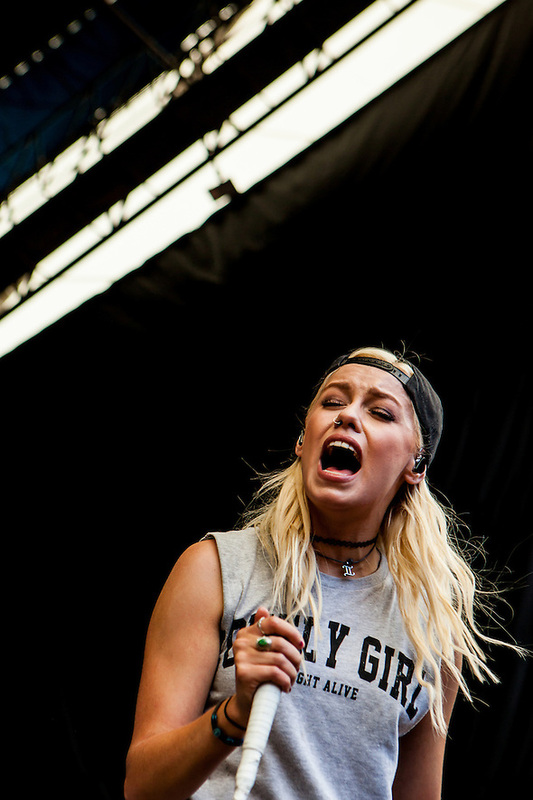 Jenna McDougall, the lead singer of Tonight Alive, asks a different question with her Lonely Girl T-shirt. Is loneliness as shameful as it was to my generation? See more photos from their set. Before Julia Roberts went to Notting Hill, Gwen Stefani was “Just a Girl” with the punk band No Doubt. In the same year (1995), Alanis Morrissette “recommended getting your heart trampled on to anyone.” “You cry, you learn….” Humans want love, but we also want to know how to survive loss. The Warped Tour encourages survival. The UK band Bring Me The Horizon might be difficult to explain to the Barry Manilow crowd. 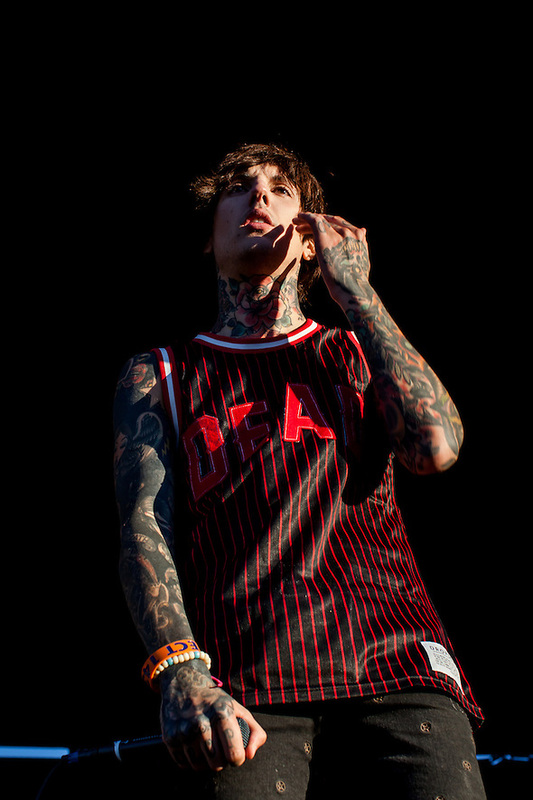 Lead singer Oliver Sykes does not look like an artist and clothing company owner. He looks more like a stage diver than someone who sings the lyrics, “can you feel my heart.” He does all of it. See more Bring Me The Horizon photos. 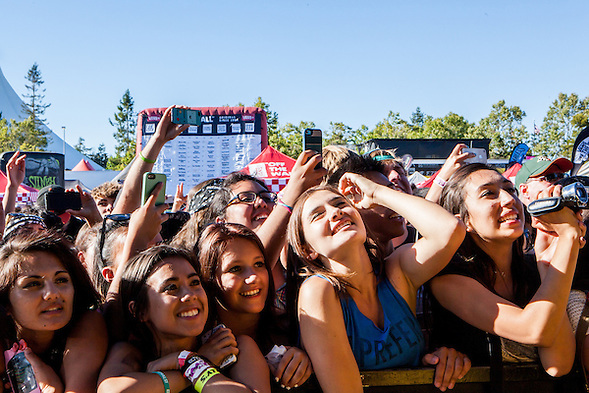 Positive messages and clothing are part of the Vans Warped Tour experience. This year I bought a T-shirt from the non-profit To Write Love On Her Arms. TWLOHA also has high school storytellers campaign. TWLOHA’s mission promotes hope for those struggling with depression and related mental health issues. The organization’s vision statement reaffirms love and community. Never Shout Never is not quite Neil Diamond or Gene Simmons. The lead singer Christofer Drew Ingle reminded me of Bob Dylan and Dr. Phil. This combination would not have worked with my generation, but Never Shout Never fans love it… and there are millions of Never Shout Never fans. If not for Vans Warped, I would not have heard of this band with millions of fans. My favorite Never Shout Never song is called Trouble. I must have listened to the song 100 times, probably more. The Lyric Video has more than 13 million views. The YouTube music video looks like a PowerPoint presentation. 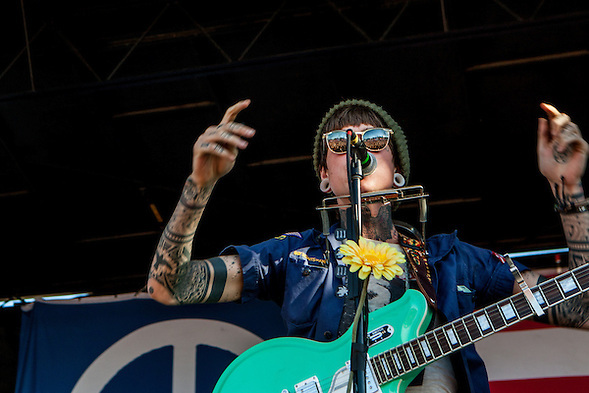 Christofer sings about falling apart over a woman. To his fans, the song is endearing. As much as I enjoy the song, I feel exposed. It is one thing for Jewel to sing, “You Were Meant For Me.” It is somehow different for Never Shout Never to dwell about a woman who is “sooooo Rock & Roll and out of (his) league.” He is in so much trouble that he starts “listening to jazz” (or probably the soundtracks to “Notting Hill” and ”When Harry Met Sally”). When he sings, “and that cellular, will be the death of us…” I feel that he is singing about everyone who has loved and been disconnected. or run through the pouring rain searching for a definitive yes, and still seeking an answer. This entry was posted on Sunday, July 7th, 2013 at 11:28 pm. 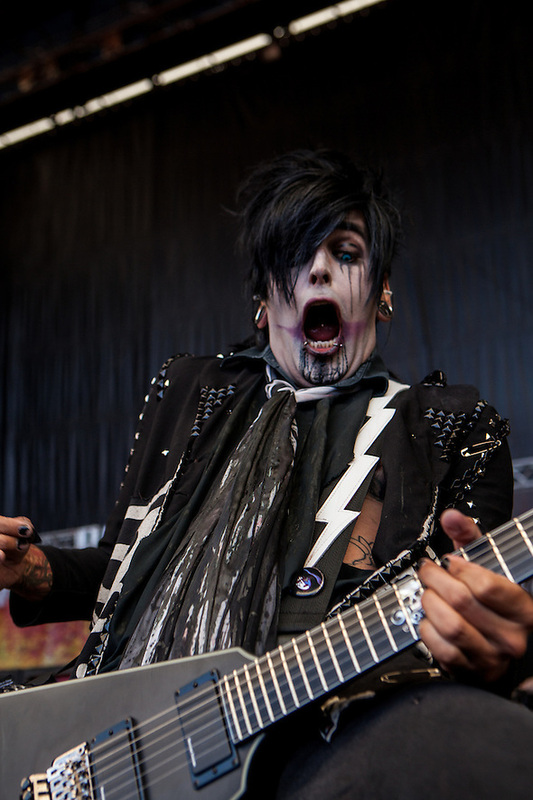 It is filed under Music Photography and tagged with Bryan Farley, Concert Photography, Vans Warped Tour. You can follow any responses to this entry through the RSS 2.0 feed. Absolutely fantastic! Can’t wait to see your shots! It was great meeting you! I still have the two photos I took of you. They are at the beginning of the folder so I see you almost every time I open my Warped Photos. Before I forget, what band did you most want to see? What band was your favorite of the day? What band surprised you the most? I posted more photos since we communicated. They are at http://www.bryanfarley.com in the concert photography section. Great photos! And I agree, Vans Warped Tour is for sure one of the things I look forward to every year. Always a fantastic show and truly the best day ever. Were you able to find the link for the photo galleries? Where are you going to catch the show this year? Who do you want to see/ interview? 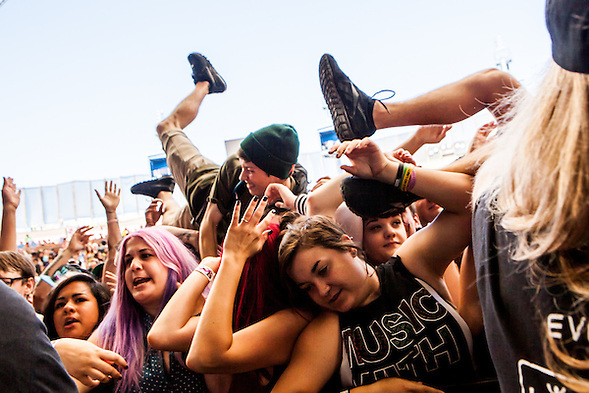 Did you shoot Warped this year? hello , im 13 im emily and i would love to know if i can voleenter to be a photograpgher but im scared im might not be old enough , and i hardly had experience . I am probably not the best person to ask this question. I have taken my children (not students) to concerts and they have photographed a few bands, but I stood with them and watched them very closely. I have a picture of my son right next to the stage when he was 4. The camera was as big as his face. At 13, you might want to attend Warped as a fan and visit the artist booths first. See if you can interview bands or start something with your school publication. Do you have anything with your own school? Lastly, try small venues and local acts. Practice talking to musicians if you do not do so already.